An eventful day aboard the Jewel of Muscat. Winds have ranged from 15-20 knots most of the day and we reached a top speed of 6.6 knots in the early afternoon. In the last 24 hours we’ve covered 105 miles–great news. The high winds have also brought two-metre swells so the ship has been rolling dramatically, as you might be able to see in today’s photographs. But the crew is handling the rough conditions well and we take great care as we move about the deck. 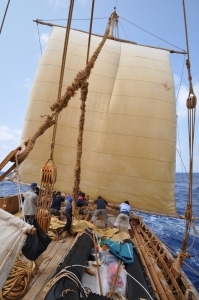 When the winds exceeded 16 knots, Captain Saleh ordered the crew to replace the mizzen sail with the smaller, safer storm sail. It was a tricky bit of work to make the change in such swells, but after an hour and a half of effort by all hands, the procedure was completed successfully. At the moment, we continue to use the storm sail. We shall soon arrive at the pre-determined waypoint from which we turn almost due east and enter a channel that will bring us between two of the Lakshadweep Islands. The channel is 40 miles wide, but we shall still have to exercise extreme caution as we make our way through the passage tonight. Once on the mainland side of the islands, we hope to have clear sailing eastward to Cochin. We had a couple visitors today. The first was an airplane from the Indian Coast Guard that flew by this morning and made several low passes over the ship as the crew waved their hats. The pilots radioed their greetings to Captain Saleh and the crew and asked how we were doing. Captain Saleh responded with his own greetings and with thanks for their concern for our welfare. Our second visitor was a Bridled Tern which landed for a while on the upper yard of the main sail. These birds breed in the summer on the offshore islands of Oman, but then head seaward in the winter where they spend months at a time without settling on land. Our friend today, however, was clearly looking for a place to rest. Upon close inspection with binoculars, we saw that its breast was heavily stained with oil and it was trying to clean itself while perched on the yard. The strong winds and the rolling of the ship prevented it from staying long and after about fifteen minutes it flew off towards the east. The crew is already talking amongst themselves about what they will do first when they get to Cochin. High on everybody’s list are calling home, a shower, and a long sleep.